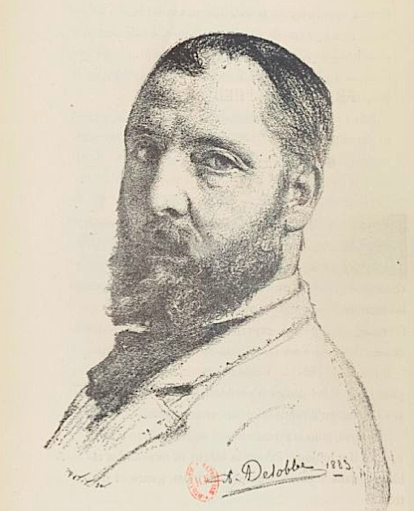 François Alfred Delobbe's (13 October 1835, Paris - 10 February 1920, Paris) most powerful influences were his deep connection to the French countryside and William Bouguereau⏭, his teacher at the École des Beaux-Arts. Born in Paris and absorbed in his studies for so many years, the young artist had few opportunities to escape the city. It was not until Delobbe journeyed to Concarneau, the native home of his friend and fellow artist Alfred Guillou, that he began to explore Brittany's rocky fields and ancient villages. While the region was painted by many of Delobbe's contemporaries, most famously Jules Breton⏭, Delobbe's Parisian upbringing perhaps made him particularly sensitive to the effects of the open skies, verdant fields, and sweeping, sandy beaches. Most of his traveling took place in spring and summer, and he used the plein air sketches he made to conjure more resolved compositions during the winter back in his city studio. Many of his favorite models came from the areas around Beuzec-Cap-Sizun and Lanriec, and the present Woman Sifting is likely from one of these coastal communities. Compositionally, Woman Sifting closely follows the example of Bouguereau's finely painted portraits of rural washerwomen, harvesters, seamstresses and local craftspeople, the tools of their trade held close in hand as they stand in vertical picture spaces in front of loosely painted landscapes. As with his mentor's canvases, Delobbe's smooth brushwork erases the presence of the painter and creates a balance between immobile, static form and rich surface details, textures, and colors. Visual evidence that a rustic, rural way of life remained, such portraits eased late nineteenth century anxieties about France's growing industrialization. There is a naturalistic truth to Delobbe's representation of the sifter, her skin slightly reddened by rough winds and harsh sun, isolated, performing her task alone. 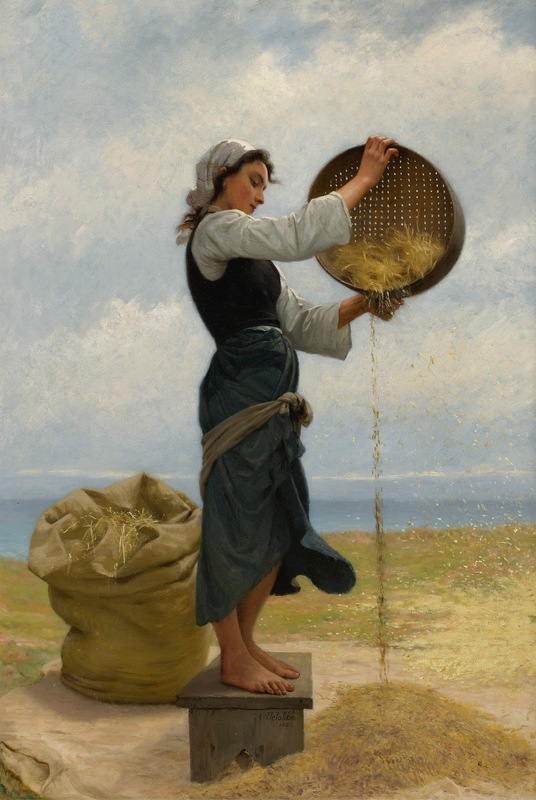 She stands on a small, roughly constructed stool, the large sieve, nearly half the size of her body, is held high as a golden cascade of kernels (likely wheat or perhaps rapeseed) rains, almost effortlessly, from her tool to the tarp below, while next to her rests a large bag heavy with stalks. While this process was notoriously labor-intensive, Delobbe's working woman reveals little of the effort involved.